All I can think of is the angle? It does prefer a more step (handle close to the face) angle. On another note: I am truly impressed by your self restraint. Having a Wolfman for 12 months without using it takes a lot of willpower! Interesting first impressions of the Wolfman @Errol and some nice reviews here. I own a number of Wolfies and find with Feather blade or indeed Gillette Rubie, Nacet or Reds that they are undoubtedly the smoothest shavers in the den on any metric. All I could suggest would be sticking with the razor, they do take some getting used to when coming from other hardware and as @alfredus has said pay your angle of attack some attention. You cannot like them all and if we did shaving would be so boring. As for not using the WR1 for 12 months the answer is simple. On the very day the poor old WR1 arrived in the post I had a real bonanzer, picking up one of the then newly released Guerrillas, a BBS-1 and a SS Scolloped Timeless. The Guerrilla was new and was put to the test straight away, used the BBS-1 and packed the other two away for a rainy day. Might be a bad thing I didn’t use the WR1 straight away, it might have saved me from buying more WR1’s. When Wolfman went to the lottery system of purchase I started checking the web site regularly and one night was lucky enough to stumble onto the web site open for business. I had worked out exactly the razor I wanted and had the recipe down pat, however when I got the chance I went for the #.74 head instead of the # .67 head I had been thinking about. It’s funny how the human mind works and leads us to making the wrong assumptions. I’ve had a Wolfman #.61 Darwin for well over 12 months and because it is so light and well balanced I had it in my head that this #.74 razor was going to feel similar. As I carefully unwrapped each individually packed piece and assembled it I had in front of me this great boofy looking razor that I wasn’t expecting. Wolfmans are elegant and aren’t supposed to be that heavy, that’s left for the BBS-1, surely. After a few days I got over the shock and started to admire the workmanship that has gone into this razor. Every piece of this razor is polished to a sheen that appears to radiate from beneath the surface of the metal. Absolutely brilliant. The quality of this razor just has to be admired; every detail has been made to the highest specification and in my favorite test of screwing the handle onto the thread of the cap everything is just so smooooth. Did I make the right last minute decision in choosing the #.74 head? From the first stroke I knew I had a razor in my hand. Thankfully the extreme tugging and pulling experienced with the #.61 Wolfman was mostly absent; it may not have been the smoothest shave ever but its good enough. With the Ladas blade a far smoother shave was delivered than with the Astra, but both blades produced a very close shave. Efficiency is on the high side of mild and in excess of the Karve CB #D plate and for me this is as efficiency a razor as I’d ever want to go. I ended up coming to grips with this razor but it is not destined for the top position of my favorite razors. @Errol Thank you for these great reviews. 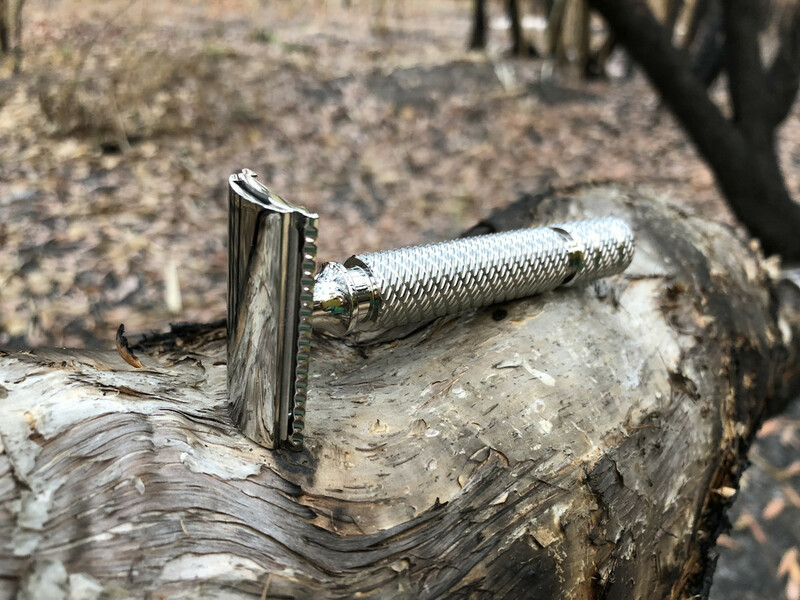 As someone who loves a stainless steel premium razor I am still not convinced on purchasing a Wolfman (BBS-1 exempted) and you keep reinforcing it. So the RS-10 will probably be my next one then and maybe a Karve SS. If you go fo the RS-10 make sure you get both plates. That razor is superb. There’s talk of a titanium RS-10 on the horizon and I really look forward to getting my hands on one of them. Great idea, will get both plates. Titanium now you are talking! Really? 110g is reaching my upper limit on weight. That is what put me of the Rocnel Elite series, too much steel. In titanium, now you’re taking. That's a myth. Titanium as a material costs more but not much ie cents more. Machining titanium is cheaper as way softer. Expensive, because we are prepared to pay more for the advantage of a lighter better looking razor. All eye of the beholder. I believe you are wrong here: while the kg of SS vs Ti might not be a big difference, getting Ti blocks (for the head) is not that easy and quiet expensive. And while a razor head might only be 50g when finished you need a lot more when you start the CNC process. As for machining: Ti is WAY WAY harder to machine. I believe James once said, that out of the same set of tools he can get either ~10 stainless heads or 1-2 Ti heads, and polishing is also a whole different level. Lol... I wouldn't say I was wrong here as there are many grades & reasons. If the titanium he is using is harder to machine then it means the steel he is using is softer and of a lower grade (which there is nothing wrong with as it isn't the landing gear of an aircraft). Generally speaking these metals are not expensive compared to each other. So the cost jump for Titanium products are not justified and it is all marketing to keep the value high unless he is chewing through his tooling. A $15 vs 10 chunk of metal is differing 150% but you only pass the $5 difference on to the customer plus machining costs not hundreds. To finish, I love titanium products and other unusual alloys that are long lasting and give character. And happy and willing to pay for it. I just hate the premium hype on everything. @alfredus Apologies and you are right, my logic differs here. When I was making & modifying steel and titanium products the steel was high grade against Ti-4 and both were treated. In my case the Ti was easier to modify as softer (still bloody hard) but the cost of doing it wasn't a lot. Ti-5 is harder than untreated 316. Again machining costs differ but not that much. CNC bits aren't expensive and the machining takes a different approach as highlighted by your links. It's just friggin easier to use softer steel and the price shows it. @alfredus funny you should say that. Two years ago when I started I drafted an adjustable design. Then discovered the Gibbs and was wow that is similar to how mine worked. Waited a year and started using CAD to put it together. Then the Rex can out and I was shocked at how close my design was. The main difference was mine would click when turned and.. you can PM for the other bit but you'll have to sign a NDA. Though unlike Balcklands you are not always lucky to nail it first time around and the costs can blow out quite quickly. Would not be surprised if Blacklands & Wolfman had adjustable prototypes already. We are not - its just now the "our dream weekly razor review"
I’m enjoying the information being exchanged. Some interesting thoughts here and I too would like nothing more than to have a quality Australian made razor whether it be adjustable or three piece.